Tipton Harriers are deeply saddened to report the death of Ron Bentley at the age of 88 after a long illness. Ron was a former holder of the 24 Hour World Record, accomplished ultra distance runner and was Team Manager for many of Tipton Harriers winning teams over many decades. Details of the funeral arrangements will be posted on the club website in due course. Should you wish to relate your memories of Ron please see the following link for how to do so. Please circulate to all those that may be knew Ron or may be otherwise interested. Links to the story of his world record may be found here. Jim Gleeson, born 14 June 1931, is recognized as one of the greatest exponents of long distance walking in Australia and he was regarded for many years as the iron man of Victorian Racewalking. I remember Clarrie Jack talking in awestruck terms of Jim's 1971 24 hour walk at the Preston Track when he set the current Australian record of 122 miles 215 yards. What made that walk so special was the incredibly bad conditions with gale force winds and very adverse conditions. So I thought it about time that I reviewed Jim's long and illustrious career. Jim became a racewalker in 1958 after Frank McGuire kidded him into the sport. He wanted to be a marathon runner but finished up as a marathon walker instead. He did thirty five 50 km races in his years with the Victorian Amateur Walkers Club (VAWC) and won the Victorian 50km titles in 1963 and 1964. His career also included various VAWC club titles and numerous placings at all levels of racewalking in Australia. The 1959 Victorian racewalking team for the National Championships Ted Allsopp, Don Keane, Noel Freeman, Alan Hancock, Laurie Hehir, Noel Norris and Jim Gleeson He won the VAWC 50 mile titles in 1961, 1962 and 1963 and this set him off down the path of long distance walking. His first effort in 1961 saw a time of 8:42:29 and a win by some 35 minutes. His second effort in 1962 saw him improve his time by 27 minutes to set a new Australian best time of 8:15:19. 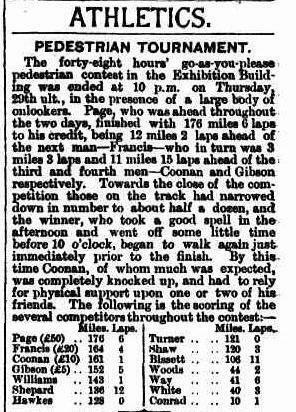 Here is how the VAWC “Heel and Toe” newsletter reported the race Showing tremendous grit and determination, Club 50 mile champion Jim Gleeson annihilated the Australian best-time on record by retaining his title in 8 hrs 15 mins 19 secs at Albert Park on October 14th. Jim becomes the first Australian to better 10 mins per mile for the gruelling journey of more than 16 laps of Albert Park lake. The half-way mark saw only two of the seven starters still on their feet, with Gavan Breen retaining the lead he had set up in the second lap. However, after being ¾ mile behind Gavan at 23 miles, Jim’s experience in this type of event asserted itself and by the 50 kilo. Mark, reached by Gavan in 5 hrs 3 mins, Jim was only 5 mins down, and was gaining hand over fist. The 36th mile saw Jim stride past the fading Gavan with the fastest lap of the race, and Gavan’s ultimate retirement was in the 42nd mile. Jim was after Harry Tetlow’s record of 8 hrs 25 mins and held his form splendidly to clock a phenomenal 8 hrs 15 mins 19 secs. Jim describes the race as his hardest ever, but it must also be his most satisfying. He trained very hard for the event – one Saturday, he walked at least 20 miles in the morning, finished second in a two miler at Mentone, and then set off for another spin in the afternoon. Jim’s performance is a fine example to all his clubmates of what can be achieved through patient and consistent hard training. The following year, he made it three in a row with a time of 8:23:05. Again, to quote from the 'Heel and Toe” Victorian 50 km champion Jim Gleeson earned himself a place in Australian walking history at Albert Park on 12th October, when he scored his third successive victory in the VAWC 50 mile championship. Jim clocked a most creditable 8.23.05 to equal the three in a row record set in 1928-29-30 by the famous Jack Lewis (to whom the people of Warburton have recently erected a special memorial). With 6 other enthusiasts, Jim set off at 7 a.m. on a cool overcast morning at a restrained 10.15 pace. Varel Newmark and Alan Hancock held a narrow lead over Jim and Gavan Breen for the first 15 miles (covered in just under 10’s). However, when Alan retired at 22 miles, Jim, Gavan and Varel came together in approx 4 hrs 10 mins. From this point Jim began to apply the pressure and, walking each 5,000m lap in just over 30 mins, drew steadily away from Gavan with Varel further back in 3rd place. 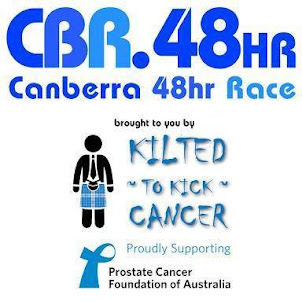 With 4 laps to go, there seemed a remote chance that Jim might even get down to his 1962 record of 8.15.19, but the strength-sapping wind took its toll and Jim was content to complete the course in his own time, recording 8.23.05 – the second fastest ever walked in Australia. Jim in winner's sash after winning his first Victorian 50km championship in 1963 Jim did many long distance walks over the ensuing years but none more impressive than his Darwin “Big Walks” of the mid sixties. In September 1961, The Northern Territory News had sponsored a 15 Mile walk in Darwin and the event proved so popular with the Territorians that in 1963, the newspaper extended the concept and added a 62 mile walk relay for men and a 42 mile relay for women. With baton-changes every 5 miles, the Army team passed the 50 mile mark in 9:03:00 and finished in a time of 11:11:00. The winning women’s team covered their 42 miles in just on 9 hours. This event gave a unique opportunity to some of the best Victorian walkers as the newspaper sponsored first one walker in 1964 and then teams of walkers in 1965-1967. 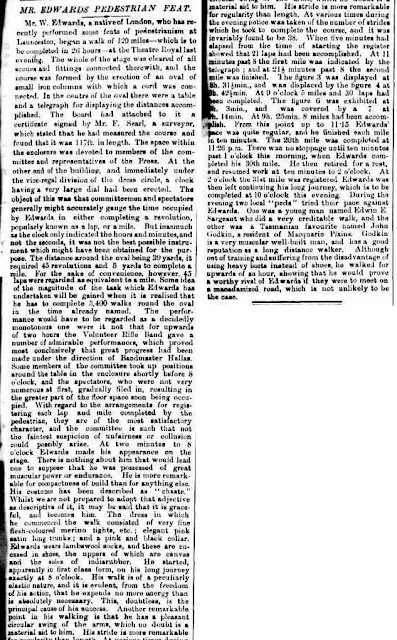 Jim was the first walker to benefit from the Northern Territory News sponsorship. A week after successfully defending his 1964 Victorian 50 km title, he flew to Darwin to compete by invitation in the gruelling race against eight teams of relay walkers (7 walkers per team). He left Melbourne on a 580F day and reached Darwin late at night on a Friday after an unexpected diversion via Katherine due to storms. It was wet season and the conditions could only be compared to a sauna. He was billeted with Frank Scully, got to bed at about 10PM and was up again at 4AM the next day to drive down to the starting point some 60 miles from Darwin for a 7AM start. The starting temperature was 920F and the humidity registered a massive 87%. Jim was to walk single handed against his rivals who only did a mile or two at a stretch before handing over to a fresh walker. The course was over laps of 8,333 km (5 miles) and a boomerang was used instead of a relay baton! From the start, the temperature rose higher and higher, and after only 20 miles, it seemed the fair skinned Victorian couldn’t last much longer – his skin was a deep red and the cruel sun was effecting even the local walkers. Jim held 3rd place most of the way and was doing a magnificent job at about 11 min miles. As the day dragged slowly on, Jim still refused to give in and kept plodding stoutheartedly on, earning the intense admiration of all who followed the marathon race. Very very tired, Jim was still only 6 mins behind the Navy team at the finish in the late afternoon, the race being won for the second time by the Army team in 10.36.10. Jim’s time of 11.03.35 was a heroic exhibition and was marked by a handsome trophy presented to him after the race. Although on the point of collapse, Jim stood as the crowd roared and clapped continuously for nearly 10 minutes. His sterling achievement was described by the organizers as ‘a superb athletic performance and classic example of endurance and plain old-fashioned guts’. The fine performance was not without its aftermath. He received second degree burns to his face, arms and legs and was taken into the Darwin hospital by Frank Scully the next day for treatment. In 1965 Jim was again invited to go to Darwin along with Bob Gardiner (3 time Olympic representative and one of our greatest 50 km walkers ever) and they formed a 2-man relay team to compete against the other 7-man teams. Conditions were similar to the previous year with temperatures of up to 95 degrees. Bob took off like a steam train, doing the fastest 5 mile leg. Jim was just over 2 mins slower than Bob for his 5 mile leg. Bob powered on, doing quick times for his next 2 legs of the journey. By the time 30 miles had been covered, they were miles ahead of their nearest rivals. Bob's next leg was the slowest that he had ever done, the heat and humidity taking their toll. He was then forced to retire and spent the next few days in Darwin hospital getting over sunstroke. Rather than stop, Jim decided to continue on and walk the remaining 30 miles alone. He did that and finished the race in 11.01.14, just over a mile ahead of the Army team which finished second and another mile back to the R.A.A.F team in third place. Again another performance to write home about. In 1966 Bob Gardiner, Ted Allsopp and Jim again travelled to Darwin for the 100 km walk, competing as a 3man team. They won of course, recording the fastest ever time of 9 hours 2 mins (a record that still stands today). In 1967 Ted Allsopp, Harry Summers and Jim went up for the last time. Again, they won in a time of 9 hours 6 mins. 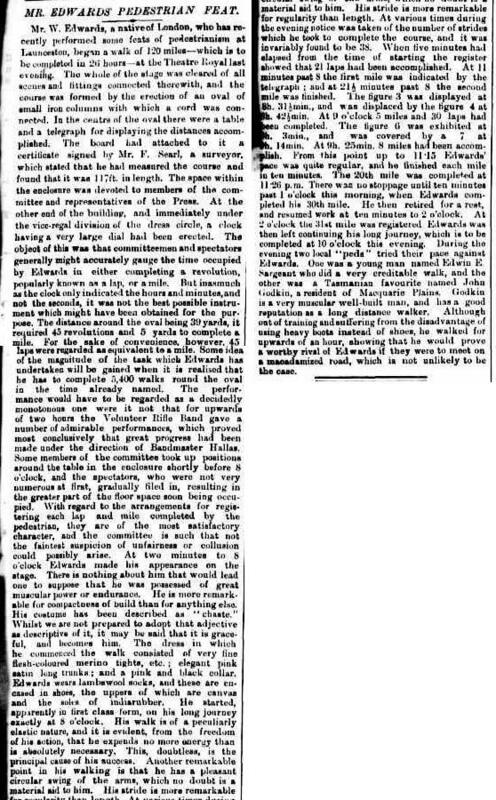 The following article in the N.T. News sums up the atmosphere well. A rain soaked Harry Summers crossed the finishing line on Saturday afternoon at Gardens Oval No. 2 and gasped, “where’s me stubbie . . . someone get me a stubbie.” Harry had just completed the last leg of the 100,000 metres relay walk for the Victorian team which successfully defended the Jack Feeley Challenge Cup. 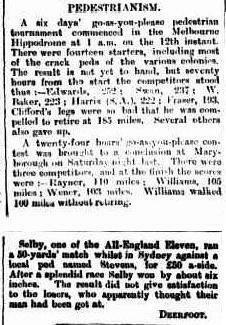 Note that the Victorians’ win detracted from the Territory team’s performance They finished only 51 mins behind the Victorians and at one stage were only three minutes behind. Jim Gleeson, Victorian walker, summed up the Territory team’s effort by saying: “They are very, very good. They have improved a lot and so have their styles.” The final leg of the race for the Territorians was walked by Walkathon winner Robert McFarlane. The Victorians said that when the rain came towards the end of the race, they took full advantage of the cooler conditions. Harry Summers, walking in the race for the first time, felt the heat and humidity so much that at one stage he was on the verge of collapse. Ted Allsopp said that Summers had looked so ill that he had had to go into a hotel and sit under a fan to cool off. But this did not deter Summers who came into Gardens No. 2 looking a mixture of red and white but still able to wisecrack as he made his way around the oval to finish the race. Of course, Jim remained competitive over the shorter distances and, in 1968, he won the Lake Burley Griffin 20 miler in Canberra, one of the first winners of this prestigious annual event. When the Australian Centurions were formed in1971 and the first 24 Hour races were set in motion, VAWC decided that they would stage one. The Edwards Lake Track in Reservoir, a recently laid rubber bitumen track set amidst parkland. was deemed to be a suitable venue. The date was set for 23-24 October 1971 and Alf Robinson, the President of VAWC, set about getting a good field in place. Although top walkers like Ted Allsop had declined the challenge, Alf had been successful in getting Jim to the line as his ‘top gun’. 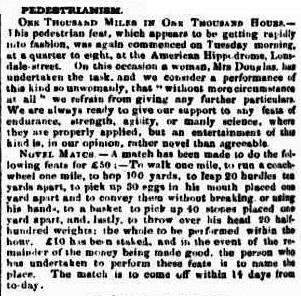 There were 9 starters overall, an indication of the healthy state of Victorian walking at that time. But competitors were unprepared for the weather conditions thrown at them during the race. At the start of the race, the wind was blowing at over 50 miles per hour. This continued for the first 6 hours, followed by squally periods of rain that continued until the early hours of the Sunday morning when the weather became hot (typical Melbourne weather, I hear you say). Jim powered through these changing conditions with no breaks at all, passing the 50 mile mark in a very fast 8:31:27, setting a new 100 mile mark of 18:33:58 (an Australian record that stood until 1979) and reaching a final 24 Hour distance of 122 miles 215 yards (this still stands as the Australian record). Next across the line was Clarrie Jack of the Glenhuntly Club. An experienced distance walker, Clarrie was not daunted by the distance and showed maturity in recording an excellent time of 20:39:45 to become Centurion Number 4. Both Jim and Clarrie eclipsed Gordon Smith’s 1938 time. Although only twenty years of age, Stuart Cooper of St Stephen’s Harriers showed that inexperience and lack of a distance background are not obstacles if you have a good style and a firm measure of determination. He too was successful in his first attempt, becoming Australian Centurion number 5 with a time of 21:36:53. The three new centurions – Stu Cooper (C 5), Jim Gleeson (C 3) and Clarrie Jack (C 4) Jim did this race on 50 km training and could not get out of bed to go to work the next day as his legs would not respond for some 24 hours. They then became black after a few days as the bruising of the muscles came out on the skin. He had to have a week off work. He fronted again the following year but being newly married and having work committments meant that he was unprepared to improve on his 1971 performance, recording 19:16:14 for the 100 miler. Jim went on to become President of the Australian Centurions, holding office from 1975 to 1977. Injuries, age and a lack of available time restricted him in subsequent years from attempting another 100 miler (what's to prove?) but he did take on the occasional long challenge. I came across a cutting in our Centurion records recording the fact that in 1977 Jim completed a 95 km walk from Richmond to Sorrento to re-enact a historic walk by Arthur Barrett in January 1893 after missing the boat from Prince Bridge to Sorrento. Jim attempted the walk to raise money for the Chelsea Historical Society's Museum Fund, completing the journey in 11 hours 57 minutes and bettering the late Mr Barrett's time by 2 hours, 18 mins. Long distance runner Tony Rafferty took 2.5 hours more to complete the distance than did Jim. At age 78, Jim looks in great shape and still does a 2 hour stroll each morning. He hopes that many more will take on the centurion challenge because as Herb Elliot said "Any fool can do a mile but it takes a man to do a marathon".